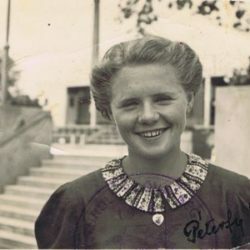 Ida Peterfy was born on October 7, 1922 to József Peterfy and Ida Kristof and a loving Hungarian family. From her early youth, God prepared her to be a leader, to work for others, and to lay down the foundation of a new religious community. On October 7, 1940, her eighteenth birthday, Sister Ida pronounced her perpetual vows in Kassa. It was not Sister Ida’s intention to begin a religious community, her one focus was to love God and bring others to know and love Him too. In following His will God called Sister Ida to bring forth a new religious community at the time, when “the universal Church was attacked in her Chief Pastor and in her religious children.” As the future of formal religious education became uncertain, the times called for religious who would dedicate their lives to proclaim the Good News of Our Lord Jesus Christ in an inspiring, interesting and dynamic way. Sister Ida, with her earliest companions, lived the vows of chastity, poverty and obedience in community life without wearing the traditional religious garb. This was necessary in order to function in the restrictive situation, and was also helpful in approaching those who were alienated from the Church by Nazism and Communism. Sister Ida had an ardent faith in God, a deep love for Him and a longing that others would know and love Him too. 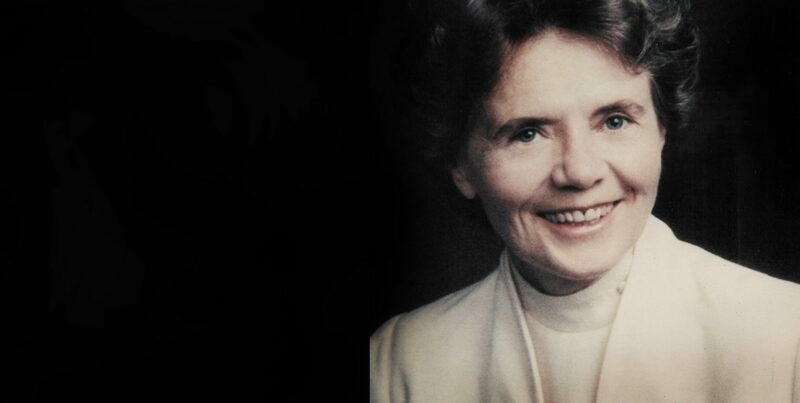 Under the inspiration of the Holy Spirit, she developed an innovative catechetical method, which became the Community’s cherished religious education charism: the Five Step Illustrated Method, to teach faith in a clear understandable way. The small community was instrumental in religious education of children and youth as well as formation of catechists and distributing catechetical material throughout Hungary in spite of the dangers of religious persecution. Following the arrest of József Cardinal Mindszenty, Sister Ida and her companions were advised by Church leaders to leave the country in 1949, continue their apostolate in the free world with the hope of some day returning to Hungary. 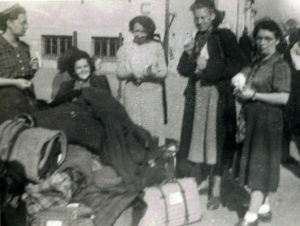 A new beginning awaited Sister Ida and the Sisters when they arrived as penniless refugees in Toronto, Canada, in 1950. In order to obtain immigrant status, Sister Ida and her companions had to work as domestics for a year, earning room and board and $40 a month. In addition to these meager earnings, and their income from working in tobacco harvests as unskilled laborers for two summers, they earned enough for a down payment for a small house and printing machines. 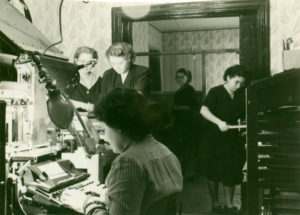 Through their new St. Joseph’s Press they had a modest livelihood, at the same time learning English. In 1956, James Francis Cardinal McIntyre personally welcomed and warmly supported the young community in Los Angeles. When Sister Ida asked him about adopting a more traditional veil and habit in keeping with the present time, Cardinal McIntyre assured her: “Don’t change . . . the Church will need you as you are.” The Cardinal’s vision was proven correct during the following decades, the Society Devoted to the Sacred Heart has harmonized the best of religious life tradition with renewal after Vatican II. 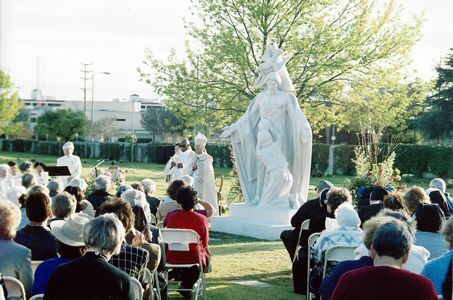 The Society was formally erected as a religious institution of diocesan right in the Archdiocese of Los Angeles in 1985. The Sacred Heart Sisters are of a variety of international backgrounds and joyfully serve the universal Church through their community apostolate of religious education in the Archdioceses of Los Angeles and St. Louis, in the dioceses of Orange and San Bernardino, and in the Archdiocese of Taipei, Taiwan, where the evangelization apostolate is complemented with significant medical work. 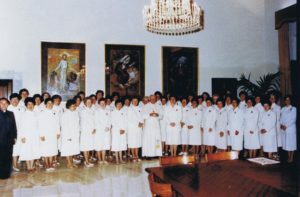 After the collapse of communism, Sister Ida and the community returned to Hungary and opened a convent in the Archdiocese of Budapest-Esztergom in Hungary, where the Sisters conduct catechist formation and extend our catechetical works throughout Hungary and to neighboring countries. The religious education charism, given by God to the community through Sister Ida, is treasured by her Sisters. 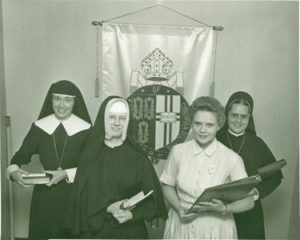 The charism is well described by the title of their newsletter, the “JOYFUL APOSTOLATE” which Sister Ida with her Sisters began in the early 1950’s. Coming Soon "Our Community History"
Beginning in the seventies Sister Ida initiated many programs to expand the community charism. Sister Ida valued teamwork as a powerful witness of Christ present through the community. She encouraged the skills, talents, innovative thinking and ideas of her Sisters. 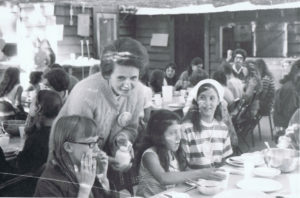 Through her leadership and zeal, in addition to the parish apostolate, Sister Ida was instrumental in the purchasing and opening of the Sacred Heart Retreat Camp in San Bernardino and the Heart of Jesus Retreat Center in Santa Ana, both in California. Both of these centers established unique locations for the Sisters’ continuing work and steadfast commitment to the enrichment of children, youth and adults, through Girls’ Camps, Leadership Retreats for young adults, as well as sacramental retreats for children and teens. Children’s camps are also conducted by her Sisters in Taiwan and Hungary. Seeing the spiritual needs of families, she developed a unique Family Retreat Camp program which is enjoyed annually by families in California, Missouri, and Hungary and periodically in other locations in the United States of America. Sister Ida led her Sisters on pilgrimages to the Holy Land, Rome, shrines in Italy and to the Shrine of Our Lady of Guadalupe in Mexico. A great camper and hiker herself, she took her Sisters to camping trips to the Grand Canyon and to the Sequoias. In 1976 they made a pilgrimage by bus with the highlight of attending the Eucharistic Congress in Philadelphia. As much as possible the spiritual trips and travels included the whole community. By producing a children’s television program for KABC at the request of the Los Angeles Archdiocese Communication Department, Sister Ida’s new teaching method, including the use of puppets, became nationally known by educators and families. “My Friend, Pookie” did so well in the Nielsen rating – on Sunday mornings – that KABC requested two additional seasons. The 27 shows were broadcast for several years. 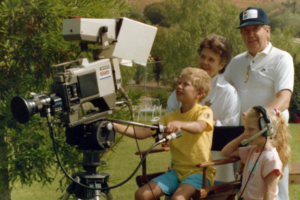 The production of the “Sacred Heart Kids’ Club” video program in the late 80’s followed at the request of parents, priests and educators, who saw how effective the Five Step Illustrated Method was. With a team of her Sisters, Sister Ida produced 30 half-hour videos with teachers’ guides, providing a unique religious education program for children. The program spread to six continents in English, Spanish, Chinese, Korean and Hungarian. When the new Catechism of the Catholic church was released in 1994, the Sacred Heart Kids’ Club was immediately recognized as a dynamic catechetical tool in complete harmony with the four pillars of the Catholic Church: Creed, Sacraments, Commandments, and Prayer. In response to the growing need for Catechist Formation, Sister Ida created the “Be a Dynamic and Effective Religion Teacher” video course to bring her unique catechetical method, “The Five Step Illustrated Method,” to catechists and educators everywhere. 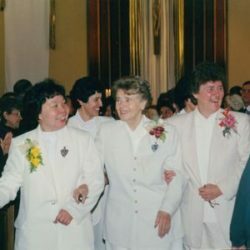 With confident openness and receptivity to the Holy Spirit, Sister Ida helped the community, “to move on into the future” with a new generation in leadership; in 1988 Sister Jane Stafford was elected, as the first American Superior General. 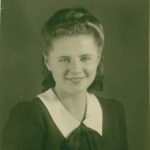 At the same time Sister Ida continued teaching the novices, giving spiritual retreats and monthly seminars to the Sisters, was actively involved in the community’s spiritual leadership and as a religious education speaker, traveled across the United States and Canada. 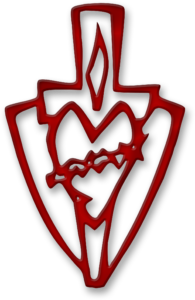 The Sisters of the Society Devoted to the Sacred Heart continue to grow in the charism of their Foundress, Sister Ida, joyfully serving the universal Church through their community apostolate of evangelization and catechesis. In the Archdiocese of St. Louis, Missouri, the Sisters were invited to teach Sister Ida’s “Five Step Illustrated Method” in Kenrick-Glennon Seminary and Paul VI Pontifical Institute bringing this dynamic catechetical method to seminarians, religious, and lay catechists in the mid-West. United in their apostolic zeal in California, Missouri, Hungary and Taiwan, every year thousands of catechists, children, youth, adults and families encounter the personal love of God through catechist formation classes, unique catechetical retreats, parish religious education programs and summer camps conducted by the Sacred Heart Sisters.